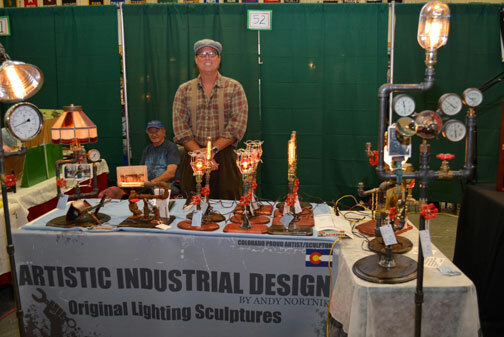 Metal Sculpture Artist Andy Nortnik became interested in sculpturing at an early age. 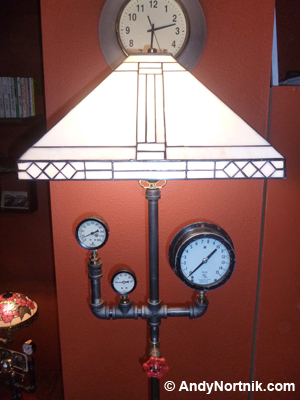 Industrial Designs of the 1920s, 1930s and 1940s fascinated him. Vintage science fiction illustrations and images from such Victorian books as Jules Verne's 20,000 Leagues Under The Sea and classic movies such as Metropolis also intrigued him. 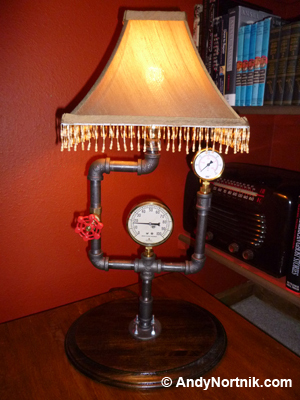 Little did he realize that later in life his love of these two art forms was to be combined and reflected in his unique sculpture design style that some refer to as Steampunk or Retro Futuristic. 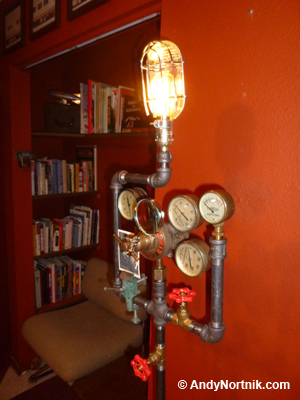 Andy combines salvaged materials such as pipes, valves and fittings and meticulously sculpts them into beautiful works of Industrial Art including Custom Reading Lamps, Desk Lamps, Floor Lamps, Clothing Racks, and Retail Display Stands for such items as Jewelry and Ties with what he refers to as "A Vintage Look For a Modern Age". 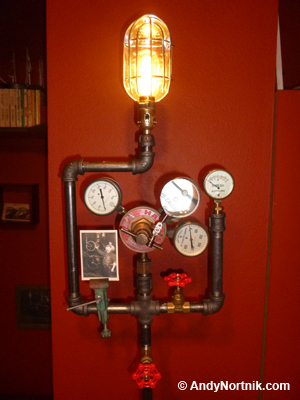 Check out his Steampunk website so see many of the sculptures Andy has for sale. 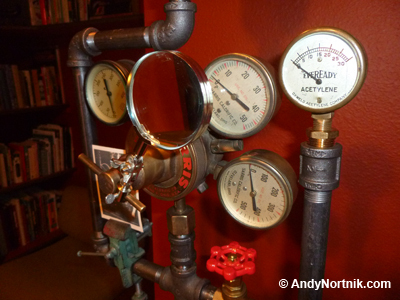 Other applications for Andy's Sculptures include Hollywood Special Effects and Lighting for Horror Movie Sets and Halloween Haunted House Props. In his spare time Andy enjoys crafting illustrations and clip art with the look and feel of classic eras gone by. 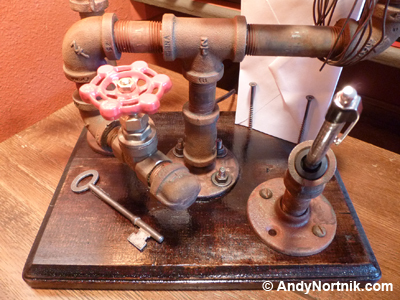 Email me andy@andynortnik.com to have a similar "One-of-a-Kind" piece created just for you! 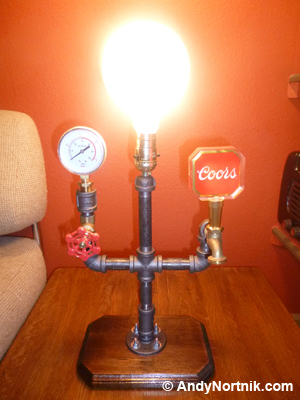 Fresh out of my laboratory, here's my lastest creation ... 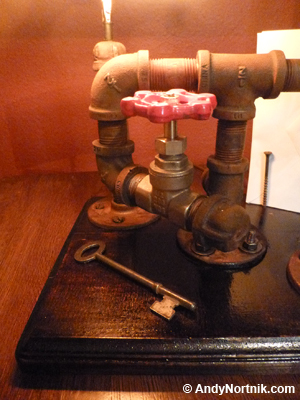 The Salvaged Desk Set! 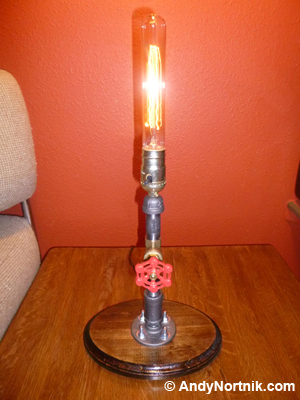 This piece measures approximately 11" Wide at the base and 13" Tall. 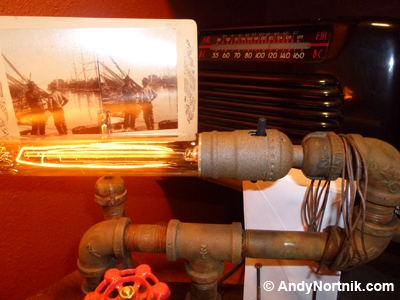 Creepy mood lighting is provided by an "Edison Style" tube bulb, but I've mounted this bulb horizontally. I've provided an ink well for either a fine pen or feather quill and four vintage corkscrew nails hold either envelopes or stationery. 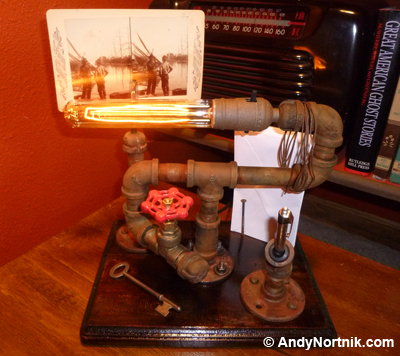 I've also created a display stand to show off your favorite vintage postcard or family photo. 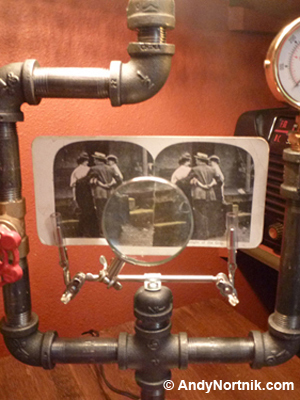 I'm displaying one of my favorite Stereoscope cards from my personal collection! I'm also experimenting with various steel oxidation methods and I've completely rusted this piece so that it appears to have been sitting in the salvage yard for decades! The base is hand finished with a beautiful Dark Walnut stain and then completed with a final Poly gloss coat. Felt pads have been added on the bottom to protect your fine furniture! 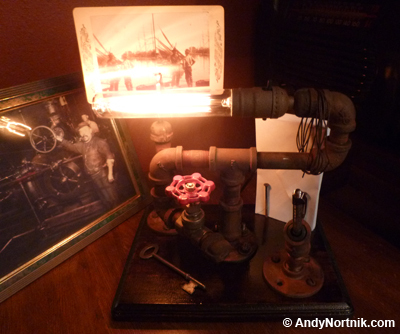 The "Steam Engine" is my latest sculpture created from salvaged vintage brass gauges, a vintage table clamp, magnifying glass and retro style drop light and reflector. 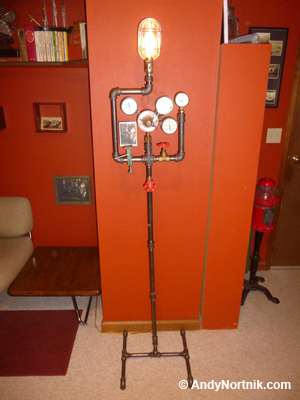 Using vintage railroad locomotive power as my inspiration, "steam is the theme." 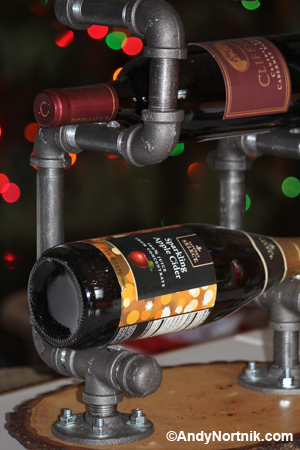 My Industrial Wine Rack, the perfect accessory for the seasoned wine tasting connoisseur or the part time amateur enthusiast. 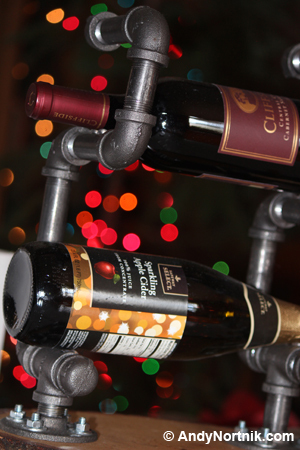 Display your favorite vintages or just your favorite bottles. 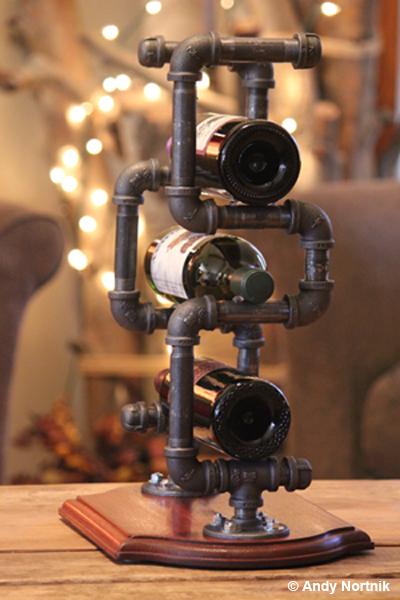 Less of a wine rack and more of a modern art piece, this rack would feel at home in a chic, urban setting such as a man cave or just as comfortable in a rustic mountain lodge. Each rack is made-to-order for you, the buyer. 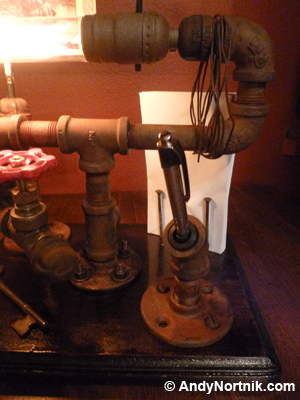 I meticulously connect pipe and fittings in a fashion that at most angles looks like just an out-of-the-ordinary rack, but at other angles resembles a 3-Dimensional puzzle created by M.C. Escher himself. 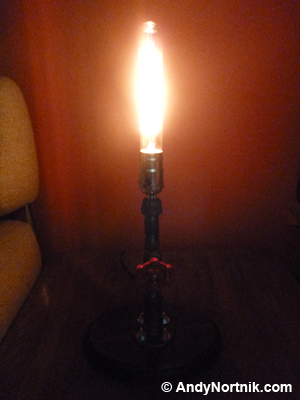 This is one of my most popular and talked about pieces and will be the center of conversation at your home as well. 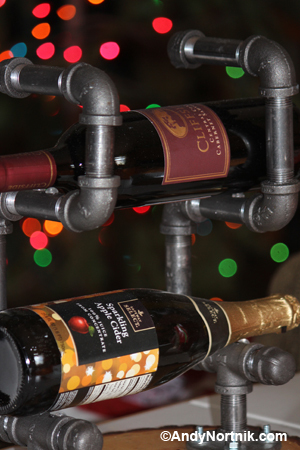 Wine Racks to display your favorite vintage (or not so vintage) wine or champagne bottles! 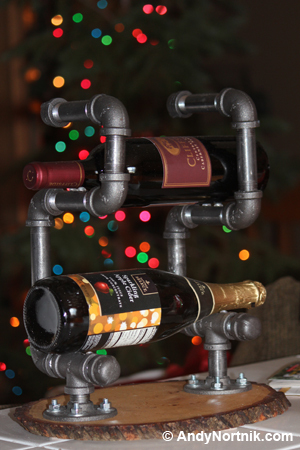 Celebrate in style with this unique and trendy gift! 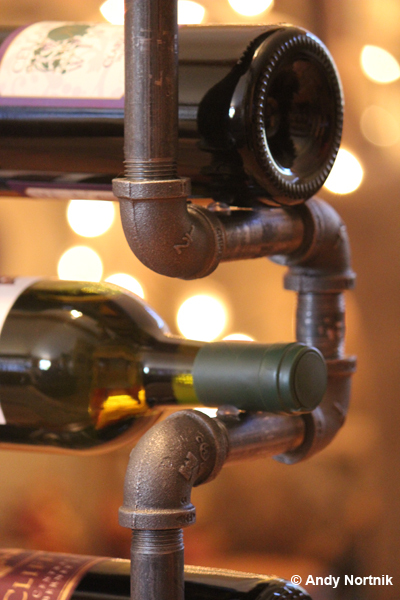 Design options include 2 or 3 tier racks, rustic pine, beveled cherry or dark walnut base and "factory steel" or "salvaged rust" patina on the pipe. 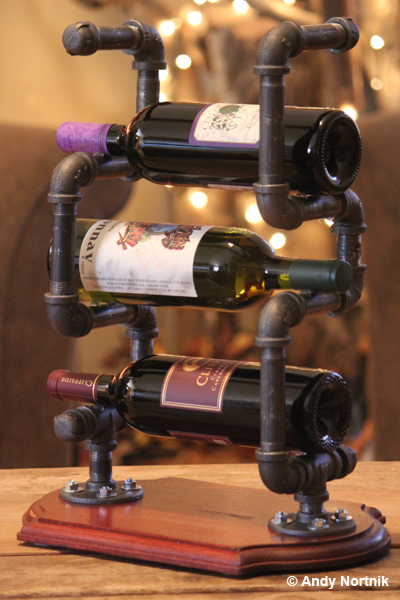 These make excellent wedding or anniversary gifts! 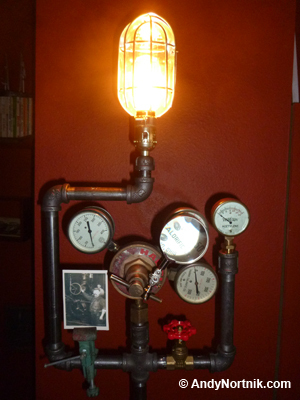 Welcome to Frankenstein's mad scientist's laboratory! 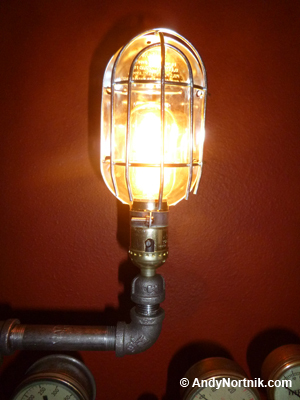 This ultra cool tube light gives off an eerie glow and will add ambiance to your Steampunk, Victorian or Gothic office, den or bedroom. 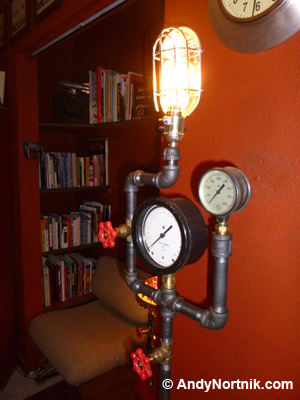 Hand made and one-of-a-kind using new and re-purposed materials including a brass gate valve and black pipe. 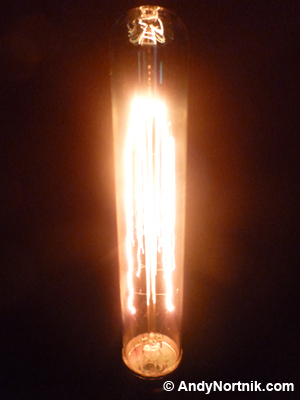 All electrical componants are completely brand new. 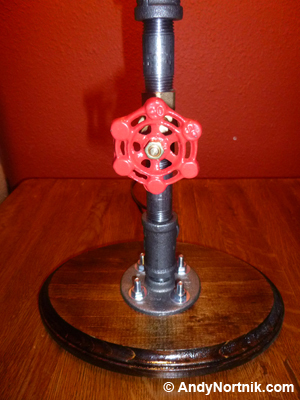 I've added felt pads on the base to protect your fine furniture! 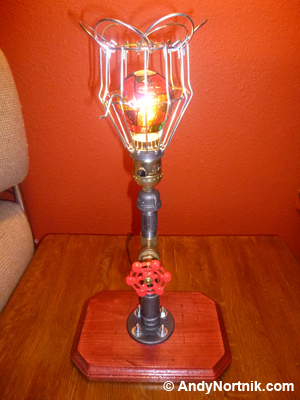 This lamp measures approximately 19 1/2" Tall by 9 1/2" at the Base. The beautifully hand finished base is stained twice with a dark walnut stain and then completed with a final coat of glossy polyurethane. 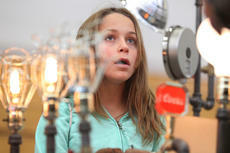 Many clients are buying these unique lamps as ultra cool night lights for their children's rooms! They put off the perfect amount of light to give a child security, but not too much to keep them awake! 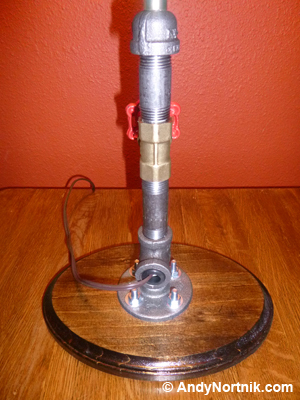 Many clients are buying these for Halloween haunted houses and attractions too! 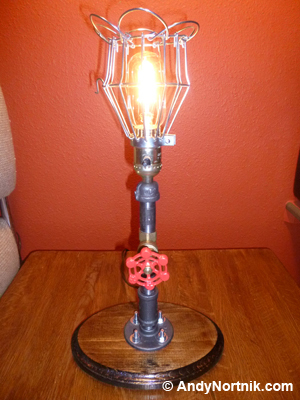 Buy 2 for a matching set of end table lamps for a truly unique gift for a friend, family member or yourself! 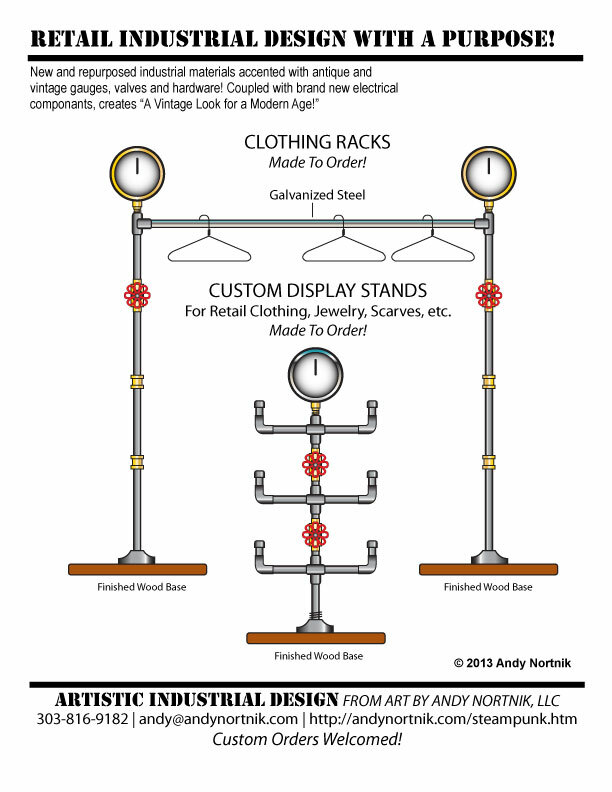 I've expanded my collection to include Commercial Clothing Racks and Display Stands for such items a Vintage Clothing, Jewelry, Watches, and more. 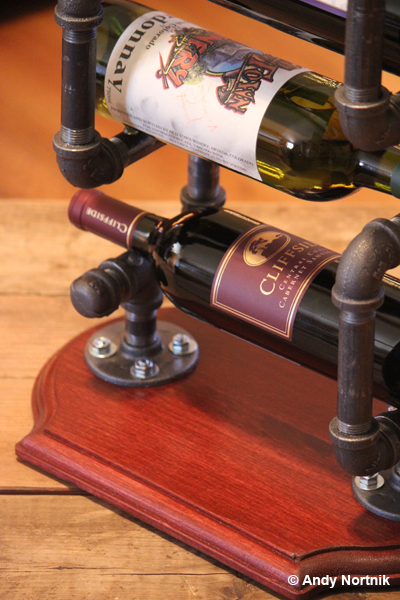 Each rack and display stand is made-to-order. 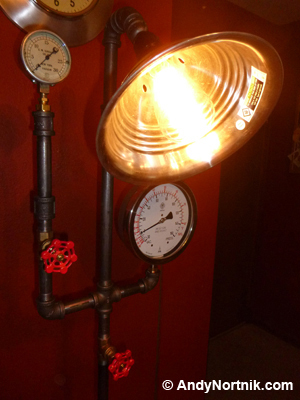 Give your commercial space a trendy, industrial look today! Contact me to discuss your individual needs. 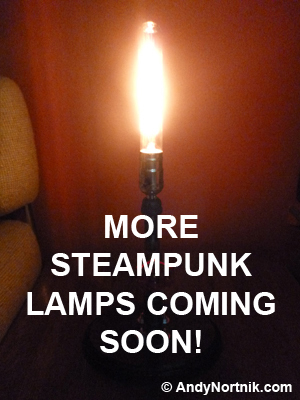 More information can also be found at the WikiPedia web page on Steampunk. 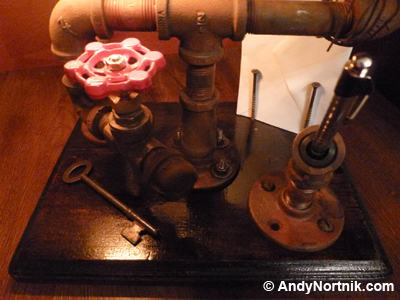 © 2013 Andy Nortnik. All rights reserved. Use by permission only. A press release for the Artist is also available in MS Word format. Please contact the Artist if needed. We've just received the most unique & retro looking wedding gift of all time! 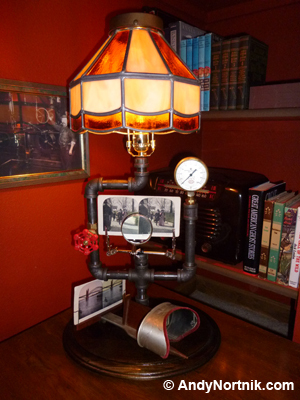 It fits right in with our family room which has a pub look, brick, leather furniture....our lamp looks as if it were made custom for the room. It's retro, new & antique all fit into one piece....luv-it. 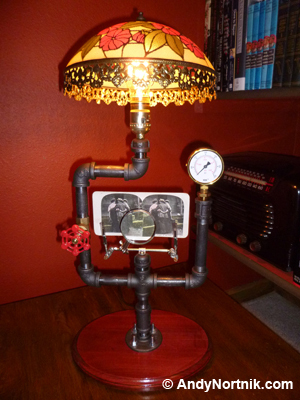 The lamp I gave my wife for her birthday is just awesome, she loves it. 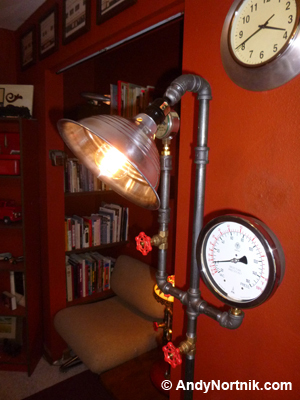 The industrial/funky style works perfectly in our house - it is a really fun addition to our living room. 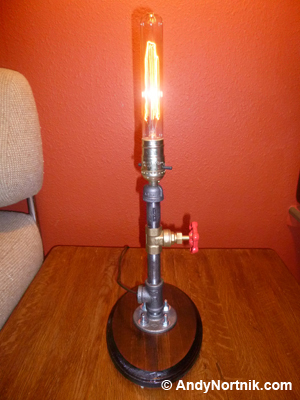 We actually re-arranged the room to feature the lamp.....great job Andy, looking forward to getting some more! 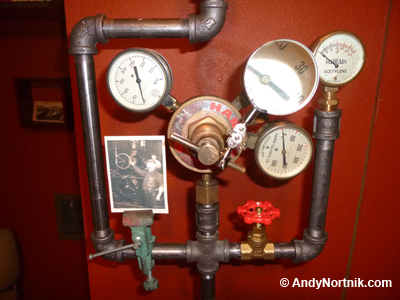 Steampunk Artist Sculptor Andy Nortnik makes Feature Article in Park County Flume News! 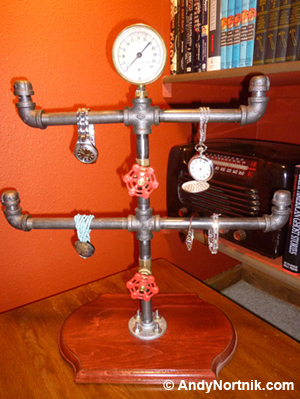 Steampunk Artist Andy Nortnik featured in High Timber Times Conifer High School Holiday Boutique 2013 Article!